Four-way Control Valve (Stack Valve) A four-way control valve (stack valve) (fig. 5-7) controls the flow of hydraulic fluid to and from a pair of hydraulic cylinders. 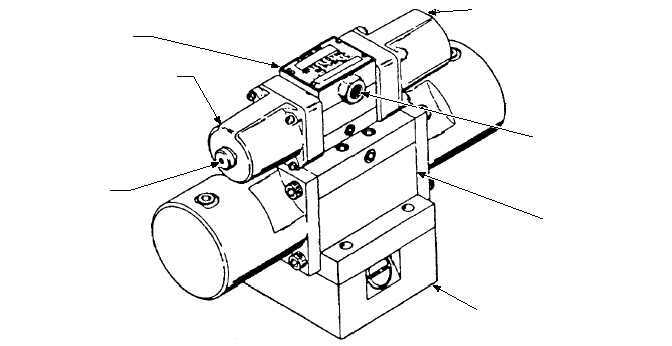 The stack valve is a solenoid controlled, pilot-operated valve assembly. The stack valve consists of a solenoid-operated valve, a pilot-operated main valve, and a sequence valve. All three valves are secured together to conserve space and simplify connection to a subplate or manifold. One stack valve controls fluid flow for a pair of panel assemblies. Three stack valves are required for Mk 7 Mod 0/2 and two stack valves for Mk 7 Mod 1 JBDs. Hydraulic fluid at 2,500 psi from the associated catapult is supplied to the stack valve with all fluid return lines going to that catapult gravity tank. The operation of a stack valve is described as follows: 1. With hydraulic fluid at normal operating pressure and neither solenoid B (raise) nor solenoid A (lower) energized, fluid flows through the sequence valve and pilot valve to both sides of the slide in the main valve. This pressure to both sides of the slide keeps it centered and blocks fluid flow into and out of both ends of the hydraulic cylinders. 2. When a raise switch is actuated, solenoid B in the pilot valve energizes, shifting the spool and directing pressure to a pilot port at the main valve side. The slide shifts and directs fluid to port A of both hydraulic cylinders. The hydraulic cylinder pistons extend, pushing the crank assembly of the operating gear aft and rotating the shaft. Rotation of the shaft extends the operating gear linkage and raises the associated panel assemblies. During the raise cycle, fluid in the cylinder lower port B vents to the gravity tank through the main valve. If the raise switch is released during the raise cycle, solenoid B deenergizes, a spring returns the solenoid spool to the centered position, and panel movement will stop. Fluid flow will be as described above in step a. 3. When a lower switch is actuated, solenoid A in the pilot valve energizes, shifting the spool and directing pressure to a pilot port at the main valve slide. The slide shifts in the opposite (from raising) direction and directs fluid to port B of both hydraulic cylinders. The pistons retract, pulling the crank assembly of the operating gear forward and rotating the shaft. The rotation of the shaft retracts the operating gear linkage and lowers the panels. During the lower cycle, fluid in the raise port A vents to the gravity tank through the main valve. . If the lower switch is released during the lower cycle, solenoid A deenergizes, a spring returns the 5-7 SOLENOID-OPERATED PILOT VALVE SOLENOID B MANUAL PUSH PIN (BOTH ENDS) SOLENOID A THREADED FITTING FOR CONDUIT CONNECTION PILOT-OPERATED MAIN VALVE SEQUENCE VALVE ABEf0507 Figure 5-7.Four-way control valve.